The Albany Pine Bush Preserve is a rare, unique natural landscape of national significance. 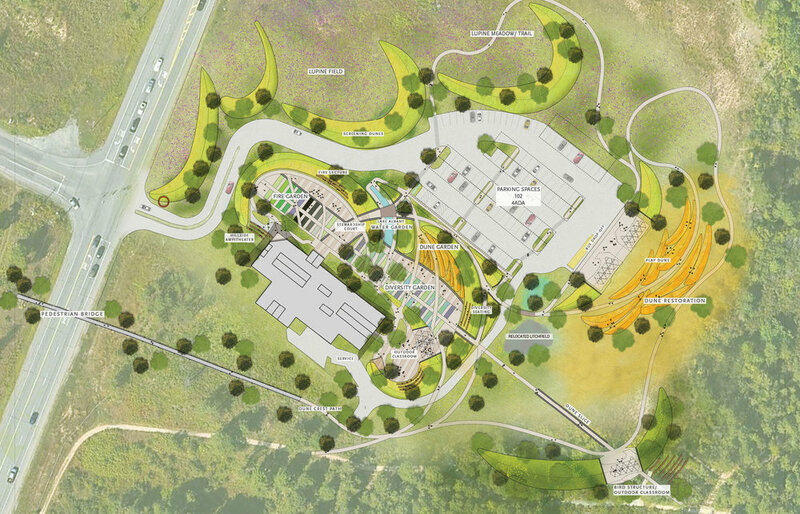 Cycle was commissioned to work with the Albany Pine Bush Preserve Commission to develop a conceptual master plan for the Preserve’s Discovery Center Grounds, a 4 acre site adjacent to the preserve. Utilizing natural elements of the site such dune forms and native plants, Cycle has developed a concept plan that helps to restore and re-connect the preserve’s unique natural topography while providing opportunities for interpretation and education through bridges, interpretive play areas, outdoor class rooms, and new “diversity” gardens. Cycle’s work included an assessment of the Discovery Center itself for energy performance and net-zero energy efficiency, and assessment of the potential for utilizing solar energy and on-site storage. Cycle also investigated traffic flow through the site and developed a solution that would considerably improve pedestrian safety, increase parking capacity, and provide substantially more exhibit and garden space without disrupting sensitive habitat.